Add the number of domestic abuse deaths prevented and the number of perpetrators prohibited from acquiring firearms to the number of prevented suicides (or the use of firearms by people mentally unstable to own one), prevented accidents, and prevented criminal activities in this and other countries together, and it’s pretty easy to justify the Firearms Act (and, as has been pointed out again and again, it did not cost $2billion dollars). You are correct in stating that you haven’t been using an emotional plea, and neither have I. There are fellows in other countries such as Uganda, Argentina, Nepal and Serbia, working on the same issue that I am. However, in those countries, there are no harmonized laws. Take a look at the statistics on domestic abuse and the use of firearms in those places, and maybe you’ll understand better why sometimes regulation is a good thing. I’m here looking at the Firearms Act as good practice, determing what elements are useful and what changes could be made to make the legislation even better. So by me being here, I am working to help other places in the world that you say are in need of people like me, with convictions. Please tell me I’m wrong. Please tell me that Ms Mandelman didn’t just try to compare domestic violence in Canada to domestic violence in 2nd & 3rd world countries. The above comment was taken from Elizabeth Mandelman’s blog. She’s working with IANSA on their Disarm Domestic Violence campaign. The campaign was recently launched in several countries around the world: Argentina, Brazil, Burundi, Cameroon, Canada, Colombia, DR Congo, El Salvador, Haiti, Liberia, Macedonia, Mali, Mexico, Namibia, Nepal, Nigeria, Pakistan, Paraguay, Peru, Portugal, Serbia, Sierra Leone, Sri Lanka, Sudan, Togo, Uganda, Uruguay, and Venezuela. I’m not going to raise the question of what Canada could possibly have in common with the other 27 countries on that list. I am going to ask if Ms Mandelman actually believes the segment that I highlighted. Because it sounds to me like she is implying (if not outright saying) that the primary reason that our firearms use and domestic violence rates are lower in Canada, is because of our laws. So the extreme poverty in most of those countries has nothing to do with it? The staggering lack of education is irrelevant? Not just the history, but the culture of violence that is so prevalent in many of those countries isn’t important to the issue of domestic violence? And the fact that the majority of the countries on that list are traditionally patriarchal societies in which women have few inherent rights – that doesn’t factor in at all? You see, I’ve been to several of the countries on that list. I’ve seen first hand how their societies work. I can say with absolute 100% conviction that restricting access to firearms will do NOTHING to reduce domestic violence in any of them. Sure, it may reduce firearm use, but the crime rates and levels of violence will remain the same. 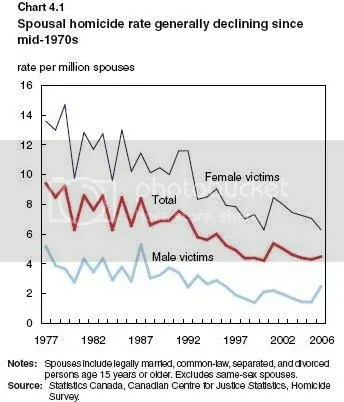 The rate of domestic violence has been declining in Canada for decades. Any claims that a law which was introduced in 1995 has had any measurable effect on the numbers are completely false and not supported by the available data. In fact a weapon is used only 7% of the time in cases of domestic violence – that’s all types of weapons, not just firearms. The section I’ve highlighted in bold shows, once again, that firearm-related crime has been falling since the 1970’s. So how could anyone claim that a piece of legislation introduced in 1995 has had anything whatsoever to do with it? Handguns have been registered in Canada since 1934. Yet, as the section I’ve underlined states, they’re still the most used type of firearm in violent crimes. So what exactly has registration accomplished again? There are many, many factors involved in the issue of domestic violence, especially in the third world. Claiming that tighter gun laws reduce domestic violence is not only statistically false, it’s also a betrayal of the victims whom the makers of these laws are supposedly trying to protect.